The best way to filter wine at home! Push wine from one keg through a plate filter and into another keg. No pumping, no oxidation, and total control over flow rates. The system can be expanded as needed by adding kegs or additional filter housings. All materials that come in contact with the wine are either stainless steel or food-grade, FDA-approved plastic or rubber. Kegs can be used for wine storage, and the gas system can be used anywhere a blanket of inert gas is needed. 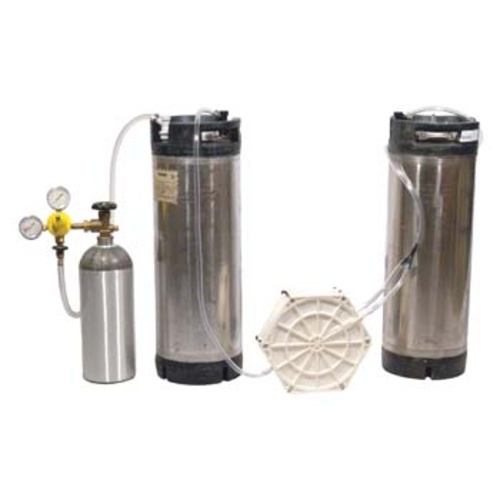 Complete filtering system includes one Nitrogen tank, dual gauge Nitrogen regulator, gas line assembly, two 5.5 gallon kegs and our FIL45B Wine & Beer Plate Filtering Kit. The kit includes a set of FIL46 Rough Filter Sheets. Additional sheets and sheets in other micron ratings can be selected from the You Might Also Need section below.